Here at FMH headquarters we sometimes hear nervous customers’ misunderstandings about at our French friends. We also get to hear and nod in agreement about the weird and wonderful practices people meet as they explore France! Having worked and lived here for some time, I have come to believe we should not be criticizing France but praising it and all its many splendid paradoxes! France being the number one holiday destination in the world has a myriad of delights to tempt the visitor so much so that as a French man would say, “why go anywhere else, it’s like here without the great food!” Now while this is not exactly true it has enough of a hint of truth to it to settle in people’s minds. Just think of the obvious attractions: French food, French wine, Paris, museums, art galleries, cathedrals, church’s, historic architecture, restaurants, croissants, vineyards, seasons, sunshine, beaches, markets, mountains, lakes, rivers, canals, quaint villages, pastoral landscapes, festivals, nightlife, jazz, …this list could go on and on but time and space alas do not so I will cover these bountiful wonders at a different date. So to my main topic – some of the common fallacies attached to France and the French. One of the most common fallacies is that the French are rude. Rubbish!! I have lost count of the number of times I have heard this from people before they even set foot in France! For those that have already arrived, this misconception is generally picked up in Paris where, like any other big city, you will come across the odd rude person. However in general Parisians are helpful but not fawning (you won’t get a “have a nice day” – thank god). The French are quite a formal society and we as visitors often tread all over their customs thereby appearing rude to them! An example of this is the basic Hello and Goodbye when entering or leaving a shop, it’s obligatory in France but we tend to ignore it thereby appearing rude! This is even more important as you travel the countryside and you will find that a smile and your simple Bonjour and Au Revoir will get you very far indeed in rural France. Another common fallacy is that the French deliberately avoid speaking English. Firstly let me say I am Irish and I have never encountered a Frenchman that arrived in Ireland expecting the Irish to speak French!! Somehow we English speakers expect everyone else to understand us when we travel! C’est bizarre!! Having said all of that there has been a huge improvement in the number of French people that do have some English and in the major cities and tourist areas you will come across many an English speaker but once in rural France they are fewer and understandably nervous about using their own rusty foreign language skills. Opening times!! Let me say that if anybody ever works out the rationale behind French opening hours please let me know! Suffice to say that here lunchtime is sacrosanct and not even a trifling thing like commerce is going to get in the way. This is a concept you will need to adjust to, food and socialising are way up the ladder of importance in comparison to work and making an extra euro. Once you have this grasped, two, three and four hour lunch breaks become understandable. Sunday, that vast wasteland of economic inactivity seems reasonable, what after all is more important than Sunday lunch!! Speaking of lunch, do remember that French lunchtime often starts at midday and most shops don’t reopen until around three o’clock in the afternoon. Restaurants typically close by two thirty so they can relax with their own lunch. How civilized, if a little inconvenient if you happen to forget as I frequently do! If you come to France in July or August you will find some French businesses have closed and headed to the coast for their summer holidays (one motorhome dealership near us closes for the month of August!). They don’t seem to do skeleton staff or temporary cover, just a note in the window to say they are on holiday. Again, leisure time is simply more of a priority than whatever money they would have taken in that period, even if they are in a tourism business themselves. When you first arrive in France you may feel outraged by long lunch breaks and random shop closures, viewing the lack of commercialism with hostile disapproval but walk a mile or two in their shoes and you begin to understand. 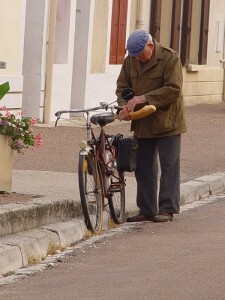 The French live life on their terms and they plan to keep it that way. They make time to exchange pleasantries with total strangers and share a joke with shopkeeper. Children still greet you in the street, family and community are still top priorities. The French won’t be hurried and pretty much never suffer from stress. They often go to great lengths to help our clients and are anything but rude. Come to France and form your own opinion. Arrive with an open mind and try having the odd long lunch followed by a snooze. See how you feel when you have entered into the spirit of it for a week or two. We bet you’ll regret how you have lived your life so far and see that there is another way! Motorhomes and campervans really lend themselves to discovering a less frenetic lifestyle, so book your French break now and come and unwind.